Most of my articles are focused on Scoliosis – and, this one is, too – sort of. But, in the Scoliosis Family Adventures family, I am the only one without Scoliosis, and this article is about ME. Well, mostly about me. I also want to talk about Dr. Morningstar and the work we’ve done together to take care of some issues in my neck area that have plagued me most of my life. When I was about 10, I started having headaches daily. We could not figure out what was the cause, but I spent many days home from school due to the pain. I was popping pills every day. One day, my Mom took me to her chiropractor and, after one adjustment, the headaches were gone. We had to keep them up periodically, but, for the most part, they were gone. It was then that we knew that it was my long neck, out of whack from playing the violin from age 4, that would need extra attention as life went on. Fast forward many years into my adult life and neck issues still plagued me. I really find value in traditional Chiropractic care, but no solution gave me any long-term structural changes. My neck would stay in alignment only for short periods of time, only to need frequent adjustments. It was when I was researching for help for my children’s Scoliosis when I found Dr. Morningstar at the Natural Wellness and Pain Relief Centers of Michigan (see my side bar for a link to their site) or click here: http://michiganwellnessandpainrelief.com/. He is a Chiropractor, but I always tell people he’s one-of-a-kind. I don’t even remember the last time I’ve been adjusted (or that my kids have been adjusted) there because he only adjusts when it’s needed – for the most part, he focuses on long-term changes to the skeletal system. He uses a system of weighted exercises (called the Pettibon system) plus many of his own inventions, that patients use to re-train their bodies into correct postural alignment. I was skeptical, of course, but figured we had nothing to lose. Now, as an Engineer, I know that it’s difficult to prove a theory. Tests require multiple test subjects and the variables have to be severely limited to be able to pinpoint an exact result from a specific treatment. Unfortunately, with my kids’ spines being how they are, it’s been difficult to say what in our litany of treatments has been what has been keeping those curves at bay. I really feel it’s a combination of a masterfully-made brace (by Luke Stikeleather at Orthotic Solutions), muscle building treatments we do at home, and our work with Dr. Morningstar. However, what I want to share with you today is my x-ray results on my neck and spine, both before and after working with Dr. Morningstar. I’ve inserted 4 photos below. The first two focus on my neck. A person’s neck should not be straight when looking from the side view. The head should rest above the shoulders and the neck should have a nice forward bend. The straight line from the head to the shoulders should continue to the pelvis (so, the lower spine should also have a little forward curve). The first photo shows my neck before and after a couple years of daily weighted treatments. You can see the drastic improvement in how my neck is aligned. I did not purposefully put it in this position for the x-ray. Both times, I sat in a natural position. The results are amazing. I still get occasional neck pain and very infrequent headaches, but I find that it coincides with periods of time when I have neglected to wear my Pettibon weights or when I’ve done something like practice violin for a while without stretching or sleep on it funny. Otherwise, my posture has changed drastically over the course of my work with Dr. Morningstar. The next two photos focus on my lumbar – you can see that before my side view was the opposite it should be – I was somehow tipped way back (probably the weight of my head falling forward messed up all the way down my spine). The second photo shows a much more aligned me. I’m still working on that tiny little forward curve, but am pretty happy with this progress. Now, the nice thing about sharing my results is that I am one of those test cases where nothing else was at work that would have changed my spine. Sure, I do yoga and exercises, but I’ve been doing yoga for over a decade – way before my work with Dr. Morningstar. Nothing else in this aspect of my life changed – just using his treatments. I know that I am only one case and that one case cannot prove the worth of any treatment, but I can personally attest that this treatment is very much worth trying. The time commitment is minimal (we live about 1 hour and 15 minutes from his office, so we only go once a month – most of the work is done at home). I could also go on and on about Dr. Morningstar’s ingenious ideas about Scoliosis, his invention of the Tornado suit (which holds wonderful promise for the future of non-surgical Scoliosis treatments), his dedication to helping all people, but specifically those with Scoliosis. I could talk about his wonderful staff (we love you, Miss Kat! ), and how I feel that throughout his career, some of his out-of-the-box thinking about Scoliosis will revolutionize the metrics used to measure curves and predict success of treatments. I could talk about all that and more, but, like I said, this article is about ME! Even if you don’t live near Dr. Morningstar, please contact him – he is working with Doctors all over the country to bring similar solutions to more and more people. He may be able to recommend someone in your area that can help you or your loved one – with any and all postural difficulties. HINT: CLICK ON THE PHOTO MONTAGE TO GET A BETTER VIEW IN YOUR BROWSER. I wanted to dedicate this week’s post to some of the new products and ideas we’ve been working on at EmBraced In Comfort. It’s been a long time since I talked about our products, because I want to bring you as much news from as many different sources as possible, but the more people that come to me for help, the more that say “I wish I had known sooner”. So, I feel a certain responsibility to keep spreading the word. We have come so far since September of 2009. Back then, we had a functional bodysuit, but it was not pretty and not as well made as I had hoped. We’ve grown and developed and our design for the basic bodysuit has improved by leaps and bounds. 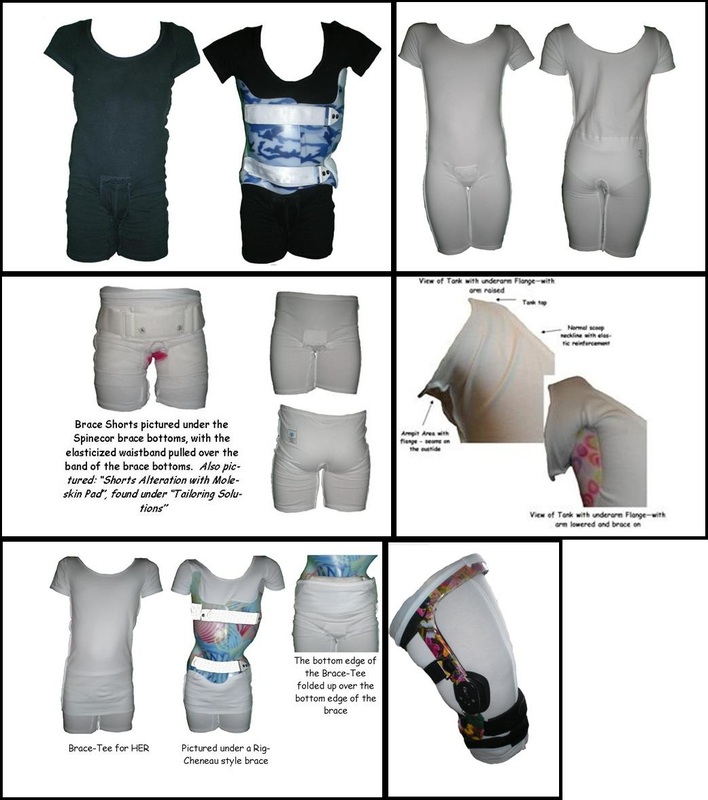 We’ve also started making specialty Brace-Tees and Brace-Shorts for people wearing all types of braces – most common are Boston Brace or Rigo-Cheneau brace wearers, who come to us and want a tight-fitting, soft tee, with seams that don’t press into their bodies, that protect their underarms from brace components that press into their armpits and a LOT of patients like the very long length, that allows them to fold the bottom up and over the bottom of the brace. The bottom of the Tee is elasticized, so it can withstand a lot of pulling and will hold tighter than the bottoms of traditional t-shirts or tanks. We’ve also had patients that want their armpits protected, but want a Tank-top look – so we answered with the “Sleeveless Tee with Underarm Shield”. So, we’ve been able to serve customers precisely where they need it – after all, most of our products come from the ideas and needs presented by patients. We don’t turn anyone away. Last year my son went into a brace, and that launched me into a whole new need: bodysuits, Tees, and shorts for Boys and Men. As you can imagine, the design would be quite different than for women. On top of the garments we make, we continue to pursue innovative solutions for problems that patients have with comfort in their Spinecor “Comfort” Shorts. We’ve added many services under the “Tailoring Services” part of our website (http://embracedinco660.corecommerce.com/Tailoring-Solutions-c3/), based on the requests of customers. One interesting thing we found is that if you are having trouble with the shorts constantly riding up, you can actually get a lot of relief by extending the legs. The reason is that, for some women or girls, the elastic of the Spinecor short falls on the fullest part of the thigh. So, if there is any tugging or pulling, the garment will always shift up and, therefore, ride up. If the elastic is moved lower on the leg, lower than the fullest part, then they don’t ride up as much because they have to defy the increase in diameter of the leg. Working hand-in-hand with patients helps EmBraced In Comfort to address very specific needs. We listen to all feedback and continually try to improve based on that feedback. One advantage to manufacturing in -house is that we can make changes quickly and efficiently, with very little inventory to flush through the system. And, for American patients, it is a novelty to buy Made In the U.S.A. products. Our fabric is a beautiful organic cotton spendex blend, that is knitted in California and Assembled in Michigan. We take pride in that fact. I will close with a photo montage of all of our latest products. Please visit our website (which also has a new look) – and, if you have needs that we don’t already address, write to me – I don’t like to leave any patient in pain or discomfort if I can at all help it! Just today I got an idea from a parent of a patient to make PADDED strap covers for the Spincor strap bottoms. I already made plain moleskin ones, but padded ones may help many more people, and that is always our goal – helping people to feel more comfortable in their braces through comfortable and functional undergarments. Pint-sized support for girls dealing with the big problem Scoliosis. Last Christmas, I knew my daughter was getting a “looks like me” American Girl Doll from her Grandma. I decided that if she was going to have the same brown hair, brown eyes, and even braces for her teeth, it would be really nice if this doll represented everything about my daughter and had a Scoliosis brace, too. I contacted the “elves” at Orthotic Solutions (where we get her Cheneau brace made), and they agreed to make us one – it came the week before Christmas, and I was so excited! The last step was to make a very (very!) small bodysuit so that the new doll could be as much like my daughter as possible. When she opened that gift on Christmas day, she was ecstatic about the doll, but she said that the brace and bodysuit were the “best gifts she’s ever gotten”. Who would have thought that a tiny brace would make such an impact? 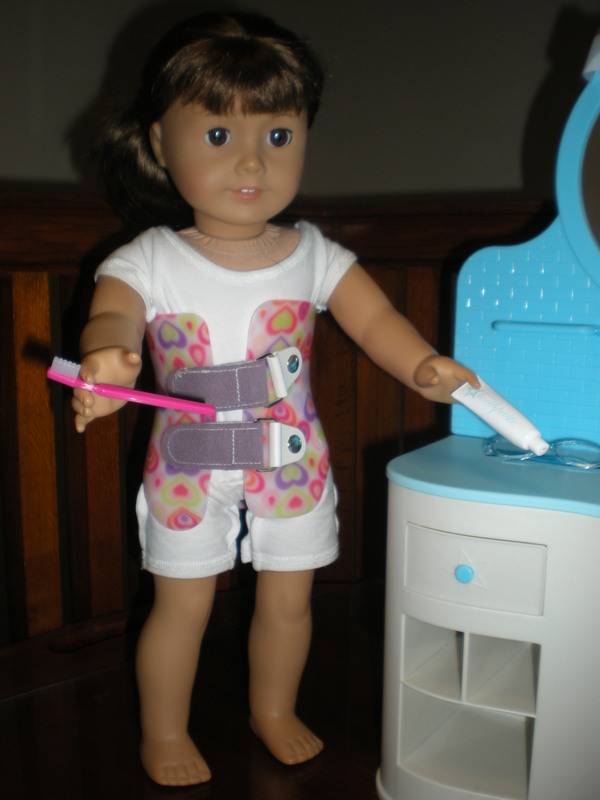 Since then, she has used the doll brace to show many girls what her brace and bodysuit are like (I’ve even borrowed Violet – the doll – to explain what I make to a couple inquiring parents). Violet and her brace have been a comfort to my daughter and, almost a year later, she is still so moved about what Luke Stikeleather and I did to make it a very special friend for her. Several months later, I got an email from a representative from The Hospital for Special Surgery about another Mom who was on the same path with her daughter, who is a patient of the Hospital’s Dr. Green, and how the doll and brace were able to help her daughter in dealing with her Scoliosis. I was able to interview the Mom, Kelly Kirby, via email and she had some really great advice for other parents dealing with the disease. Kelly tries to empower her daughter with the ability to dress in flattering ways, even though she’s wearing a brace. She also tries to let her daughter take ownership of her allotted time out of brace every day, and she’s enlisted the help of capable adults at school and other activities to help her daughter into her brace when necessary. She also feels that it is very important to validate her daughter’s feelings. When her daughter is feeling down, she holds her and lets her have a good cry, and then wisely tells her that, although it doesn’t seem fair that she has to wear a brace, that all kids are dealing with one issue or another (or will be at some point), and it’s just that her brace is a very visible issue. Kelly and her husband have even taken their mission a bit further, using the doll as an educational tool that they take to their daughter’s school to educate her classmates on Scoliosis. (I may steal this idea!) The doll has provided a great opportunity to demonstrate what a brace entails, without a patient having to expose their own brace to their friends. Also, it is a great tool for their daughter to speak out about her illness without feeling too shy or “on display”. There are a few other aspects that Kelly and I agree on. First, Kelly Kirby and I agree on the importance of dressing for a brace – both on top of and underneath the brace. While they have come up with some off-the-rack solutions that work for them, I continue to make it my mission to make the highest quality, most comfortable, Scoliosis-specific undergarments possible. But, we both recognize that the most important thing is to keep patients comfortable and compliant, in order to allow their braces to work effectively. Also, we agree that it’s important to find support – both for the patient and the caregiver. 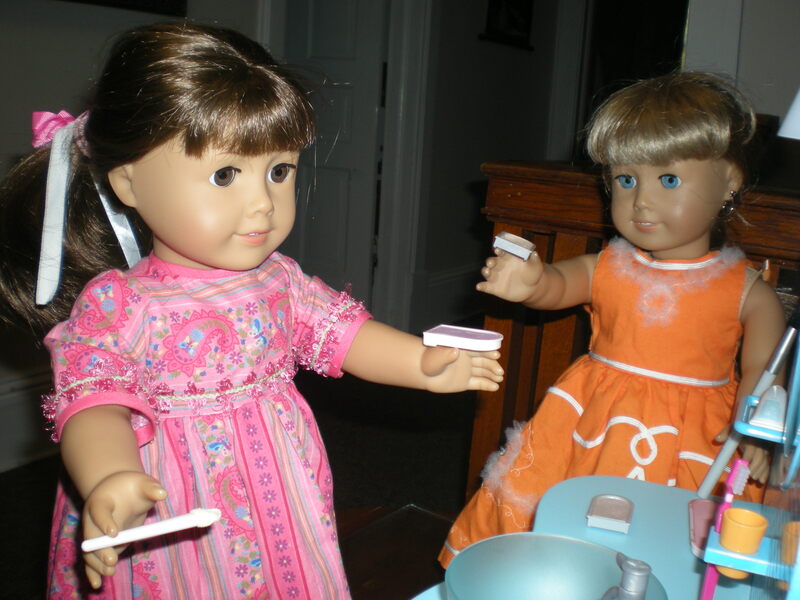 Girls – young ones, especially – can find comfort in their doll-friends having the same trials as they do. And, parents can find comfort in reaching out to other parents – something that Kelly said was critical for her in the beginning. When you get the support you need, you can then turn around and support others. If you are interested in getting a doll brace for your child, I urge you to contact your brace provider. Some may be willing to work with you. We were lucky that we see someone who is so compassionate and caring that he made it so easy for us. Kelly contacted the company that fitted her daughter’s brace (Biodynamics in NYC) and they, in turn, contacted the company that manufactures her brace, who used the American Girl doll of the owner to fabricate a brace that looked exactly like her daughter’s. It was a wonderful gesture on their part and your provider may be willing to do the same. Kelly went as far as to call the American Girl company and plant some seeds, but so far they do not offer such a product. However, if you are able to procure a brace from your provider, EmBraced in Comfort is making a limited time offer (until after the holidays) for one FREE 18-Inch doll sized bodysuit or Brace-Tee with a purchase of a regular child bodysuit (or Brace-Tee). Just email me with your request through my website or comment on this blog post. Limit one per family. Violet brushing her pearly whites. Violet's friend Kirsten does her hair. All dressed and ready for the day. Lessons learned from a little boy and his crooked little flower. Great news in the field of Infantile Scoliosis. I was recently emailed some really great information about some parents making a difference in the field of Infantile Scoliosis. Up to this point, my exposure to Infantile Scoliosis has been non-existent, because I’ve had my hands very full dealing with my two children’s Idiopathic Scoliosis. However, I am very impressed by the work of Jennifer and Russell Leggett, and their desire to educate other parents dealing with Infantile Scoliosis through the self-publishing of a book called “Cole and The Crooked Flower”. (http://www.rockethub.com/projects/2483-cole-and-the-crooked-flower) They are currently raising funds to publish the book and, although they have met their initial goal, will continue to raise funds in order to grow the amount of books they can publish. They want to make this book available to all families dealing with Infantile Scoliosis, and use any funds generated to support the wonderful work of the Scoliosis Outreach Program. I had the privilege of reading a few pages of their upcoming book and it is a very creative, whimsical, and relatable story about a young boy that goes to many lengths to “cure” a little crooked flower that he found in his yard. Although I have yet to see how it ends, I think this book will be a wonderful way to support children and their families during their battle with Scoliosis, but also to educate them and promote non-surgical solutions to the problem. The excellent news here is that the Leggett’s son Cole, after spending a year in serial body casts, is growing nice and straight! Through their own diligent research, and the help of the Scoliosis Outreach Program, the Leggetts were connected with one of only a handful of US doctors that are trained properly in the casting technique. The Scoliosis Outreach Program (www.infantilescoliosis.org) was founded by another amazing Mother, Heather Hyatt Montoya, who wanted to create an educational tool for other parents. She paired up with Dr. Min Mehta, who has straightened over 100 infants/young children by treating them early in their development with a series of corrective plaster casts. She has followed her patients after 10 years, and they continue to remain straight. In an email from Jenn Leggett, she explained to me that only the Mehta/EDF casting, when applied using the Early Treatment principles, has shown to provide positive results for these children. US research shows that 75-80% or more of kids who get Mehta/EDF casting before 20 months and with curves under 50 degrees will get complete correction. It is crucial that the children are diagnosed early and correctly to maximize success. As with all things, there are exceptions to the rule – kids who have other underlying causes for their Scoliosis, or children whose spines are not flexible enough to respond to treatment, but for the majority of cases, this is very promising data. I’ve said it time and again: when, and if, your Doctor tells you to “wait and see”, please don’t listen!! Do something. Disclaimer: something non-surgical at first! 🙂 And, the Leggetts and Heather Montoya have done something, not just for themselves, but for other families. If your family is battling Infantile Scoliosis, please get in contact with the Scoliosis Outreach Program and join with other parents who are fighting the battle, too. Don’t wait and see – ACT and SUCCEED! Last Friday I took my children to see the move “Dolphin Tale” (http://www.pluggedin.com/movies/intheaters/dolphintale.aspx), which is loosely based on a book “Winter’s Tail” (http://www.amazon.com/Winters-Tail-Little-Dolphin-Learned/dp/0545348307/ref=sr_1_1?s=books&ie=UTF8&qid=1317559778&sr=1-1), which is based on the true story of a dolphin named Winter who was found on the shores of Mosquito Lagoon (near Cape Canaveral, Florida) in December of 2006. Her tail was wrapped in the rope of a crab trap and eventually Doctors were forced to Amputate her tail plus 2 vertebrae. She developed spinal deformity (sort of like Scoliosis for Dolphins) because she was compensating for loss of her tail by swimming in a side to side motion, instead of an up and down motion. 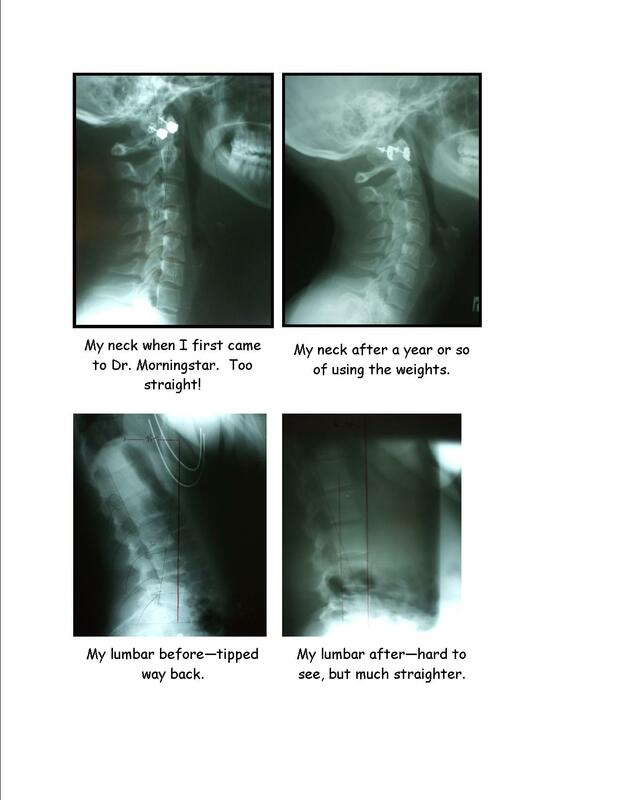 Because of this spinal deformity, they feared for her life, as they thought her organs would be negatively impacted (after all, we know that every function of the body passes through the spine – it’s VERY important!) So, leading animal expert Dr. Mike Walsh joined forces with Hangar Prosthetics and Orthotics to create a prosthetic tail for Winter. Amazing! What caught my attention the most, though, was how crucial it was to come up with the best barrier for Winter to go between her flesh and her brace. They had to invent a silicon gel just for her to make the prosthetic rub her skin as little as possible. Well, I’ve spent the last few years coming up with solutions to help people be more comfortable in their braces, through comfortable and functional barriers between their skin and their brace, so this really struck a chord with me! And, this gel they invented for Winter has helped many people in prostheses as well! Bravo! But, what struck a chord with my kids was Winter’s brave battle against her disability. Most dolphins would have died. Not Winter. She didn’t let a disability stop her, and I’m pretty sure my kids won’t either. What a comfort to them that a cute, funny Dolphin has undergone the same trials of wearing a brace as they have and still enjoys life to the fullest.